Today marks Day 7 of my Food Stamp Challenge! I am also double-posting this post on my class blog. 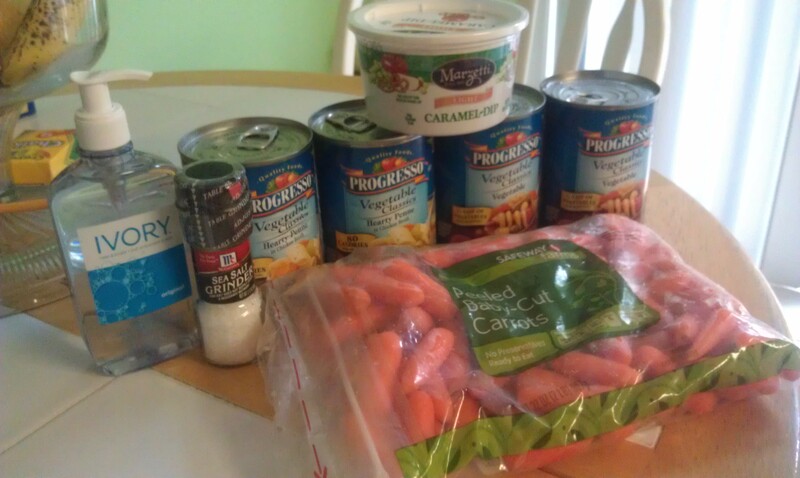 Today is the last day of my Food Stamp Challenge! I’m so ready to stop having to think about everything I eat 😉 It’s not that I’m hungry or tired of eating Ramen (Note: there was NO Ramen on my menu this week! ), I’m just tired of tracking and calculating every little thing. In the first part of this post, I’ll share what I had today and my final cost for the week. At the end, you’ll see my reflection on this project overall. 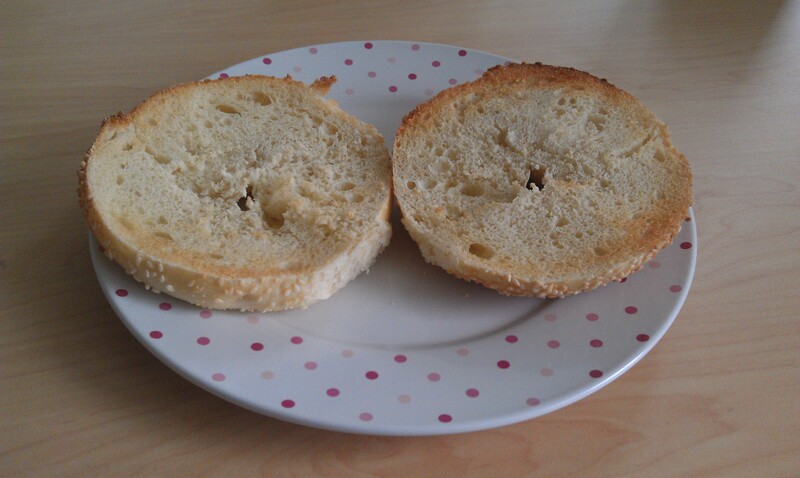 Today for breakfast, I enjoyed a sesame bagel. I got this bagel at Safeway yesterday, and it set me back $0.50. 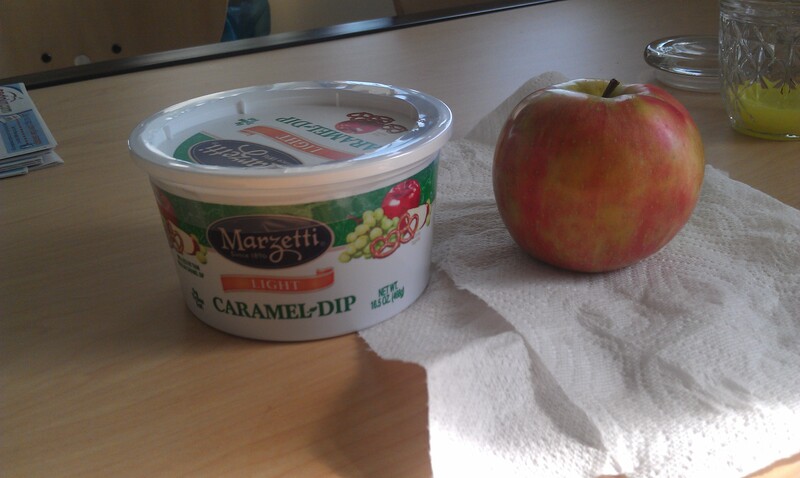 For lunch, I had a apple (Remember, that ridiculously priced kind that I got at the farmer’s market for $1.16) and some caramel that I got at Safeway for $1.50 (I ate approximately $0.40 worth). I also went to the gym today to get a smoothie. I love the smoothies there! Last year, the smoothie place was on my meal card and I ate 1-2 every single day. This year, I don’t have a meal plan and with smoothies costing $4.25 each, I have to limit myself! Because I did so good this week staying on budget, I “splurged” on a Caribbean Craze smoothie. It was SO worth it. For dinner, I made a meal that I discovered this summer when ground beef was on sale for a good price and we were looking for some “new” ways to prepare it. I found this recipe on Pinterest for Korean Beef. It’s delicious! Between the 3 of us, we ate over a pound of ground beef (my portion costing approximately $0.93). 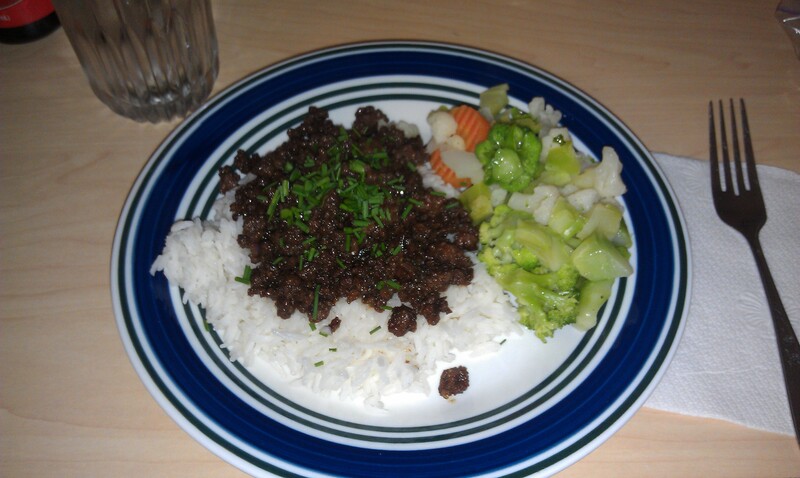 We used up a bag of frozen veggies ($0.30 cost for me) and served the beef over rice (approximately a $0.20 cost for me). The chives/green onions were free, as they were from my garden. Rice is a staple that everyone should have on hand and know how to cook. You can buy a bag of rice in bulk and it lasts quite awhile! We eat rice a lot because it’s cheap and good for you. We prefer the brown rice, but were short on time tonight, so white rice was made. As I’ve mentioned before, purchase meat when it’s on sale and purchase enough for leftovers and to freeze. “Good” prices are going to vary by region, but for my area: $2.50 is a great price for ground beef and $1.99 (or less sometimes) is a great price for boneless chicken breasts. If you ever get “too much” meat, you can always freeze it and learn new recipes to make a new dinner for your family. My total for today is $7.74! I got fruit, veggies, and meats all in one day! I obviously could have spent less, but I still stayed under budget. Week to date: $3 + $2.75 + $3.15 +$2.49 + $6.94 +$2.85 + $7.74= $28.92. I have $1.08 left of my $30 budget! Yay! Now that I’ve gone a week on the Food Stamp budget, do you think it’s doable? Is it fair to give someone $30 a week (or approximately $120/month -which is what I find more acceptable because savvy shoppers know you can’t buy everything you need in just one week)? From my experience, I’m going to say YES! I’m sure many people will disagree that $30/week is unreasonable, but I know people who successfully feed their families on a budget even less than what Food Stamps gives. It IS possible, but there are things one must understand. Is it possible to stay on budget if you have certain allergies or conditions? A lot of the times, it is possible. There are usually ways to get around certain allergies by purchasing other foods that meet the nutritional values that you’re lacking. For some families, this isn’t possible, and I understand that, but you can always evaluate your shopping habits to see what you really “need” and see what things you can substitute with that may be cheaper. Do you have to shop the sales and use coupons? Not necessarily, but it certainly helps a ton! Many of the items I ate over this week, I was able to eat them for free or very cheap due to coupons. There are so many online resources that help people coupon and save money at your local grocery store. Spending a hour or two every week could significantly cost your shopping costs. You can use coupons and Food Stamps at the same time; why not get the most out of your money? At the very least, shop the sales, especially with meat! Paying full price for everything is never going to keep you on budget. If ground beef (or cereal, carrots, etc.) is on sale at the beginning of the month, buy for at least the rest of the month! You may have to use up money from upcoming weeks to buy these items in bulk, but it does save you money in the long run. There is NO denying that. Does it take a lot of planning? Yes, it really does. Planning for your meals instead of buying on a whim or eating out is extremely important to staying on a budget. Once you get used to shopping for particular dinners, buying in advance, and packing lunches, it becomes second nature, but it is something that a lot of people should be trying. Planning for what your family eats can save you money and time. Plus, eating in is healthier for your family and also increases table-time discussions! Can you stay on a budget and still eat healthy? Absolutely! You saw in my posts, that I had fruits and/or veggies every single day. I avoided processed foods as much as possible. Compare produce prices at your local grocery stores and shop the sales, as always. Buying frozen veggies (especially when they go on sale for $1) is a great way to get veggies on the table. Food like rice and beans are staple foods, meaning they can be used for many recipes, but they are also inexpensive and are good for you. Limiting junk foods is another huge money saver. Can you still have splurges when you’re on this budget? Of course! If you eat frugal in most of your meals, you should definitely have room to eat out every once in awhile. I was able to get food out 3 times this week (Panera bagel & tea, Chinese food, and a smoothie). When eating out on a budget, you still have to be conscious of what you’re ordering (I chose a $1.19 bagel at Panera compared to my usual $7 panini) and often times you can share with friends on family (like Chinese food). Even though I was able to eat out a few times, knowing how to cook is extremely important! If you don’t know how to cook, contact a family member or take a class. Cooking at home saves a lot of money. Lastly, can everyone stick to this budget? Absolutely not. There are some people who have extreme allergies, do not know how to cook, don’t have access to health foods, and don’t know how to plan for meals and buy sale items/use coupons. Not everyone is able to eat on $30 a day, but I don’t think it’s too hard to ask that everyone reevaluates how they are spending. I guarantee there’s something that can be changed to help you save some money! That marks the end of my Food Stamp Challenge! I hope you guys enjoyed reading the posts. Next time you go grocery shopping take a moment and see if you’re able to cut back on some purchases and save some money. Everyone, even those not on food stamps, should be learning how to stick to a budget! You can see all my Food Stamp Challenge Posts here. Today marks Day 6 of my Food Stamp Challenge! I am also double-posting this post on my class blog. My budget was not too much on my mind today. It’s much more difficult to watch what you eat on the weekends. I went home this weekend so it messed up my challenge since there is a lot more things I eat there. During the week, when you’re on a schedule and out of the house during the day, staying on a budget (using coupons and sales, of course) is reasonable. But during the weekend, it’s much more difficult! It’s so much easier to buy anything I want on the weekends (that’s when I shop) and eat out while I’m doing errands. After getting home from shopping this morning, I ate 4 chocolate chip cookies. They were delicious! I got the whole bag of cookie mix for $1 (after coupon). 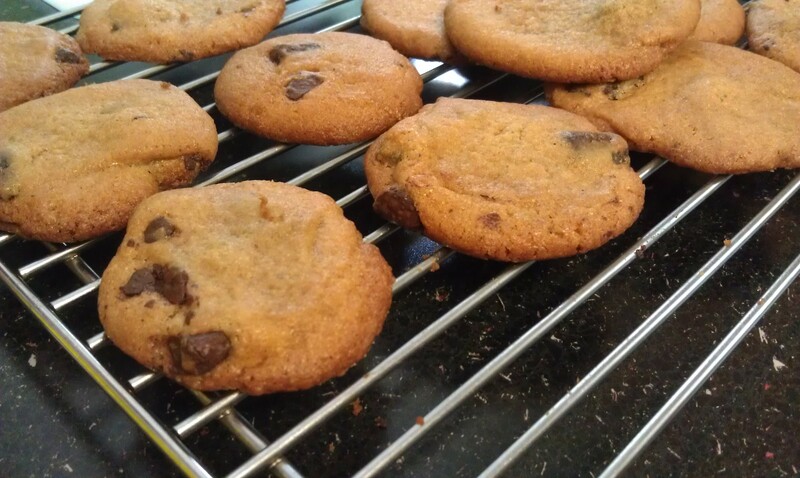 It made about 18 cookies, so my total cost was $0.22. My family ate the rest of the cookies! 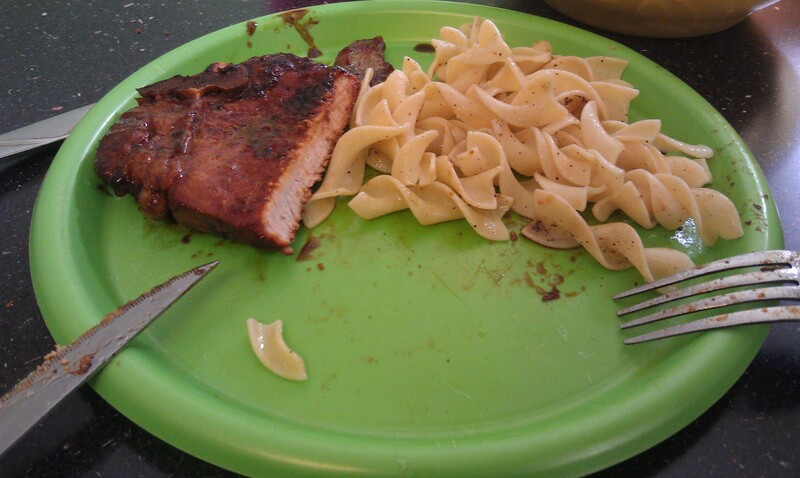 For lunch, I made BBQ pork and some buttered noodles. We were still cleaning up from yesterday’s canning adventure, so it had to be something quick and easy. We got the pork chops today at Safeway for $7.41 for the big pack. We used half ($3.71 worth) for lunch. I ate one pork chop which cost $0.93. We got the whole bag of noodles for $0.50 after coupon. I ate approximately $0.10 worth. Lunch = $1.03. I ate dinner quick because we had to head back to school tonight, so there’s no picture. I had a hamburger (no roll) and the fixings. I had some frozen veggies and sweet potato fries. The hamburger costs approximately $0.95. We bought a pack of ground beef at the grocery store for $10, froze some and used the rest for hamburgers for dinner. Since I only ate one and left the rest at home, I am only adding the $0.95 to my budget. The veggies were very cheap after coupon. I ate about $0.15 worth. I ate a bunch of sweet potato fries, but lucky the whole bag only cost just over a $1. My cost for those was $0.50. Dinner = $1.60. My total for today is $2.85! I really thought I was going to go over budget today, but that goes to show you that cooking yourself and buying meats based on sale price and other groceries with coupons is extremely important. A day doesn’t go buy where I don’t eat or use something that I got for cheap/free after coupons! Week to date: $3 + $2.75 + $3.15 +$2.49 + $6.94 +$2.85 = $21.18. I have $8.82 and 1 day left! Today marks Day 5 of my Food Stamp Challenge! I am also double-posting this post on my class blog. I had an extremely busy day today, so I didn’t even think much of my budget. I woke up early to go to the flea market and thrift shops. 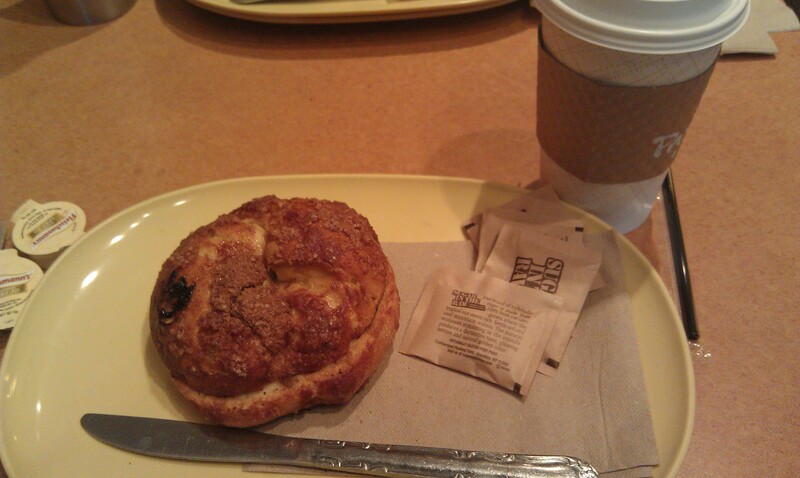 While out, my boyfriend and I stopped at Panera to get breakfast. Had I not been on this Food Stamp Challenge, I would have bought my usual $7 panini, but I was good and bought a Cinnamon Crunch bagel for $1.19. My boyfriend got a breakfast sandwich and a muffin, unfortunately I had to stick to a bagel. 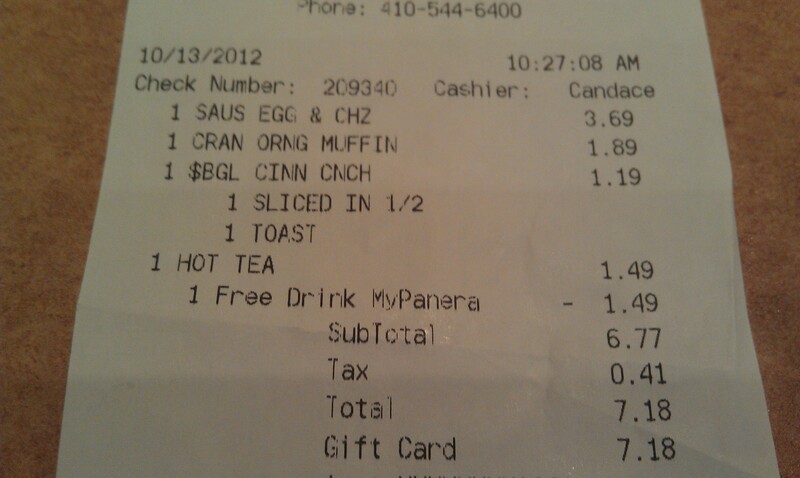 On our Panera card, we had a reward for a free drink, so I got a hot tea. To save money and get the most out of your budget, be sure to take advantage of store cards to get the bonuses. Breakfast cost = $1.19. We canned probably over 50 jars of stuff today; we are exhausted to say the least! 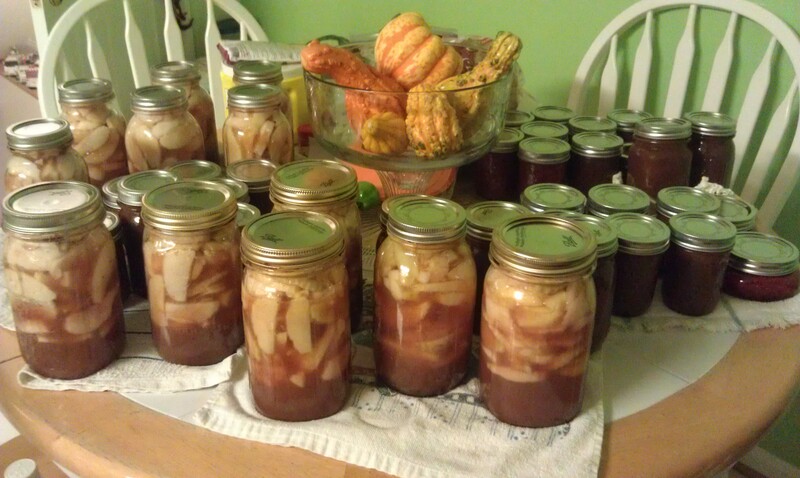 We canned a ton (and I mean a TON) of apple butter, some strawberry jam, apple pie filling, and apple jelly. When we can, the kitchen is off limits to the rest of the family. That means they aren’t allowed to fix food in there and absolutely no dirty dishes can come back into the kitchen. I need my space and organization! To keep our tummies full, we threw a frozen pizza in the oven and ate while we worked. I got the entire frozen pizza for $0.75 at Safeway (after coupons and sales). I ate about a third, making my cost just $0.25. I also had a soda today that cost $0.50. Lunch = $0.75. For dinner, since we were still canning, we had to get dinner out. Even though it’s way more expensive to eat out, sometimes it’s necessary. We got carry out Chinese food. If I were to divide our total by 5 (that’s how many people ate tonight), my portion was $5 worth. Dinner = $5. That’s way, way more than I usually spend on a dinner, but sometimes you can’t always cook at home. It’s a good thing I’ve been under budget every day so far so I could afford today! Had I not been able to stay under budget thus far, I would have been eating an entire bag of chips or some other snack laying around! I tired my best to plan around my budget today, but there was so much going on! In the long run, canning saves me and my family lots of money, so “splurging” on carry out every once in awhile ends up being alright. My total for today is $6.94! Week to date: $3 + $2.75 + $3.15 +$2.49 + $6.94 = $18.33. I have $11.67 and 2 days left! Today marks Day 4 of my Food Stamp Challenge! I am also double-posting this post on my class blog. Today in class, we talked about how it is important that people get proper nutrients when not having a lot of money to spend on food every day. For women, getting enough iron and calcium is very important. This made me go back to what I’ve been eating to see how I’m doing. Without even checking, I knew I wasn’t getting enough calcium! Aside from ice cream, you will never see a dairy product on my plate or in my cup. I hate milk, cheese, yogurt, and cream cheese, and everything else you can think of! My lack of dairy isn’t necessarily because I’m low on money every day, it’s because I hate those kinds of foods. If I was one of the people who drinks 3 glasses of milk, a cup of yogurt, and needs to put cheese on everything, I would be over budget. Dairy products are expensive and I can see how people, who like them, may have to go without them. If you use coupons, getting a great price on yogurt is fairly easy to do and watching the sales on cheese can save you money as well. Buying a gallon of milk or more a week is definitely a budget killer. Another difficult part of this project is actually coming up with the cost of the food to report back to the blog. I live in an apartment and we share food and eat dinner together every night. Even though I bought a bag of frozen veggies for $1, that’s being split with 3 people so it’s not fair to my budget to take a whole $1 out of it. I’m also not going to only shop, cook, and eat alone for the week. I live with all boys, and they depend on my food and cooking! It’s just not reasonable for me to spend my $30 at the grocery store and use it all in one week. I shop and cook for multiple people, so I’m always having to make calculations. I also never plan to live alone ever in my life, so I don’t think I’ll ever need to shop on a single person’s budget. For instance, if my other 2 roommates were doing this challenge, we’d have $90 for the week. Could we live on $90 a week? -YES! And being a couponer, as my Savvy Student Shopper readers know, you can’t just shop for one week when you go to the grocery store. If there’s a good deal, you stock up for months! Last night, we had hot dogs that I got for free. To get the deal, you had to buy 10 packs, so there’s obviously still packs of hot dogs left in my freezer! It’s more expensive to shop week by week. You must buy ahead, stock up when the deal is good, buy in bulk (only when it’s cheaper) to get the most out of your money. I think this project would be even more realistic if it lasted a month (to take into account multiple shopping trips because I don’t buy everything at once) and if I could include the number of people actually in my household. I don’t want to feel like I’m cheating the system buy having to divide my dinners up by the number of people eating, it’s just not reasonable to eat alone, when we can all eat together while I stay on budget. 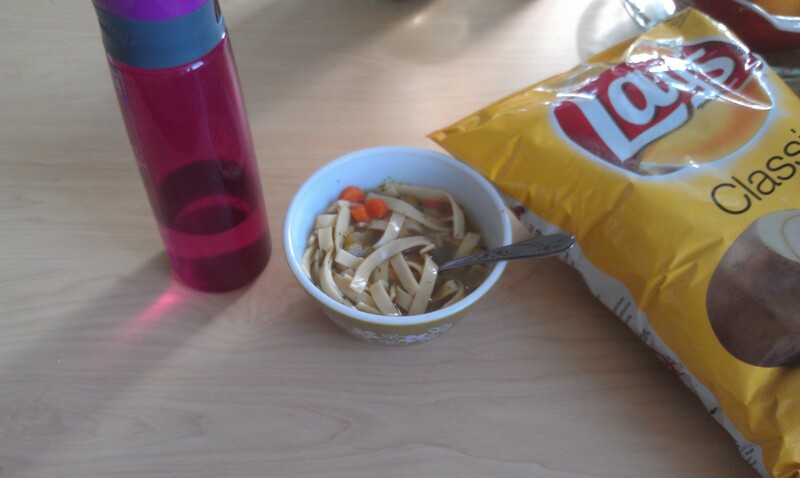 I skipped breakfast and ended up eating a lunch and snack. 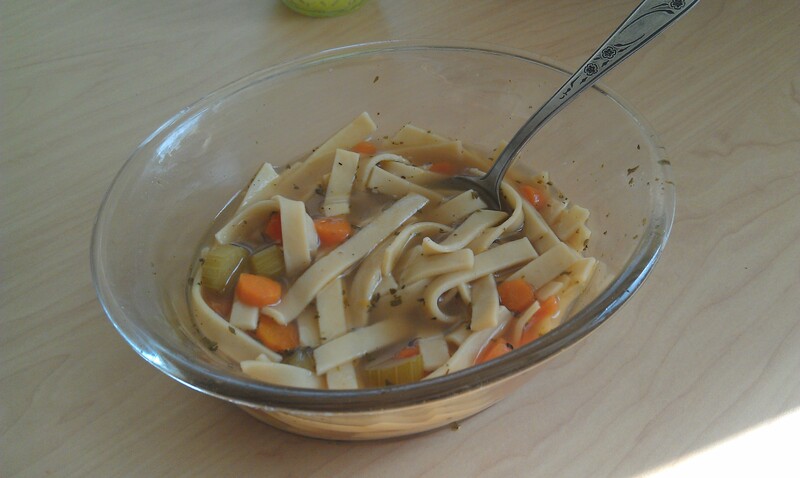 For lunch I enjoyed my last bowl of homemade chicken noodle soup (estimated cost = $0.50). 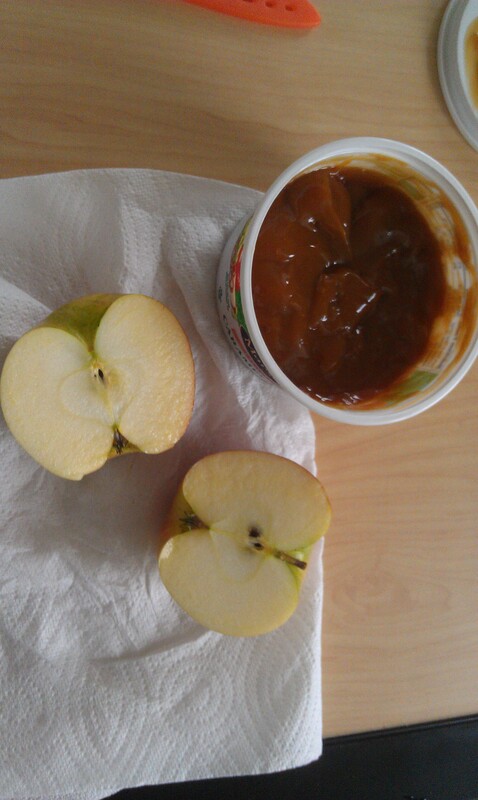 For a snack, I had an apple from the farmer’s market (cost $1.16) and some caramel. I got the caramel for $1.50 after my coupon. Today I ate approximately $0.38 worth. I’m not including the entire $1.50 because my roommates ate some too. Lunch + snack = $2.04. I traveled back home this weekend to do some canning. I won’t get all frugal and 1940s on you, but preserving your food in a can is a very good way to save money. You simply stock up on foods when they are cheap and in-season and then preserve them for the rest of the year. My boyfriend and I worked on apple butter tonight. When I do my canning, dinner is the last thing on my mind! 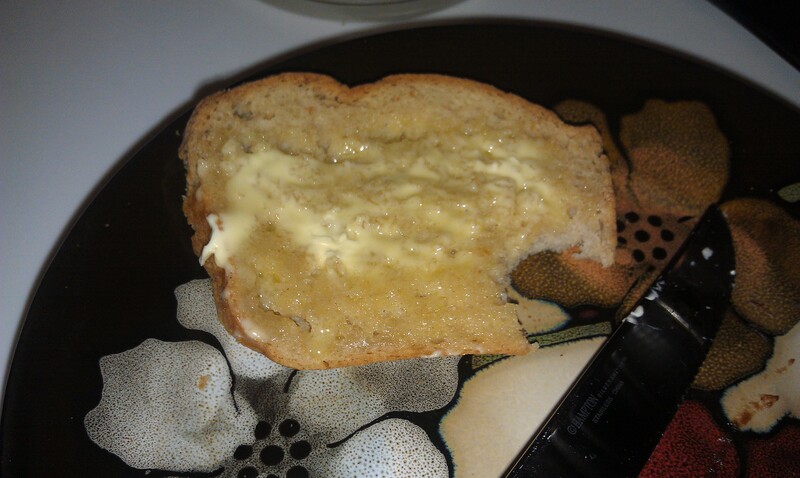 I had a piece of gluten free bread (approximately $0.25/slice). 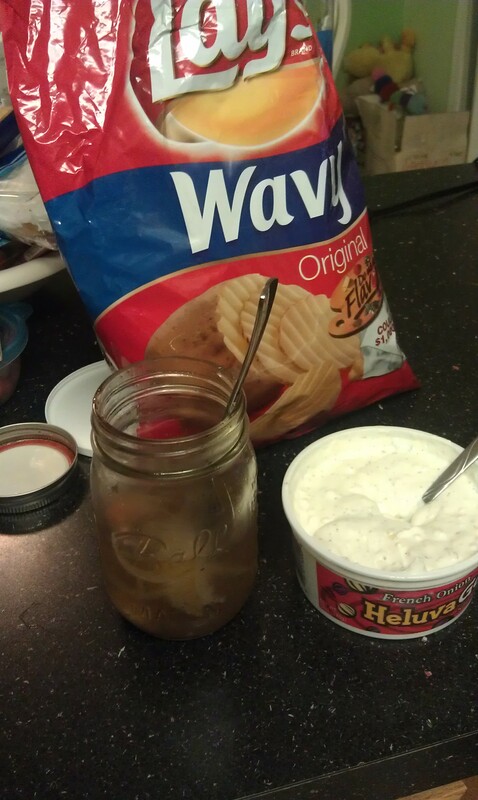 I also ate some chips and dip. The entire bag of chips cost $0.50 after coupon, and the dip was only $0.16 after coupon. I didn’t eat too much because I was busy. I probably ate around $0.20 worth. “Dinner” = $0.45. Not the best day nutrition wise, but I was busy! At least I didn’t have to stop and get fast food or something! I am hungry though… good thing I have room in my budget to splurge tomorrow! My total for today is $2.49! Week to date: $3 + $2.75 + $3.15 +$2.49 = $11.39. I have $18.61 and 3 days left. Today marks Day 3 of my Food Stamp Challenge! I am also double-posting this post on my class blog. It’s a lot easier to eat on $4.30 a day when you don’t buy every single meal out. Many people stop on their way to class or work and grab a coffee, and maybe a muffin or donut. A coffee and donut is already most of your budget for the day, if not all of it, depending on where you stop. When you are living on a limited budget, there are things you just have to say “no” too! I’m a happy camper eating in rather than out all the time, so I’m not finding it to be too much trouble staying on budget. Of course, there are times that I would love some shrimp, lobster or a nice cut of steak, but they are WAY out of budget. But are you able to “splurge” at all when you live on a budget? Of course! If you stay around $3 a day for your food (which I’ve proved isn’t too difficult), you’ll be able to eat fancy every once in awhile and it’ll be even cheaper if you cook it yourself, instead of going out to a restaurant! Watch for sales at the grocery store for your favorite, fancy foods. Around Valentine’s Day and other holidays, grocery stores have lobster tails for $5 each. You definitely won’t pay $5 at a restaurant! Learn to cook and try new foods -it’s good for you and saves you money! 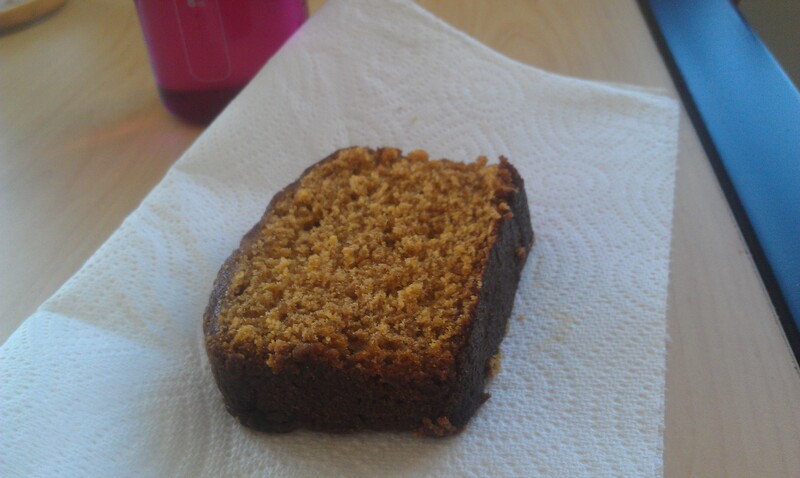 Today for breakfast, I grabbed a piece of pumpkin bread that my roommate’s mom made. 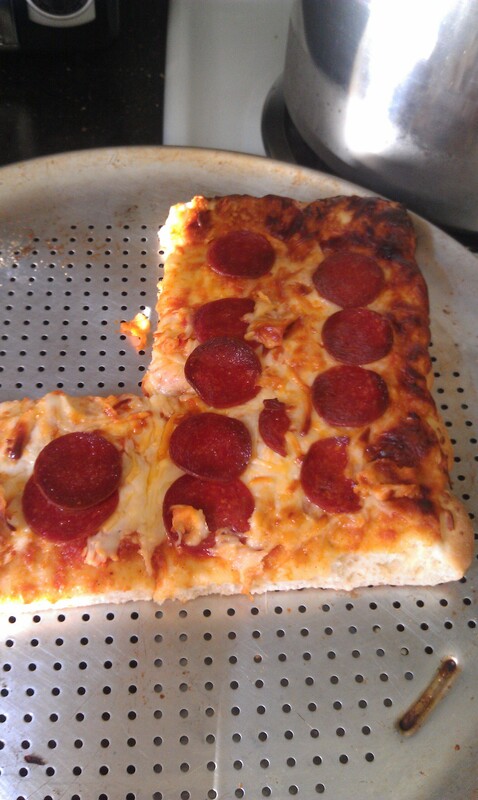 Since I don’t know exactly how much it cost to make, I’ll estimate my slice was $0.50. There are about 8 slices worth of bread, making it cost $4. That’s a pricey loaf of bread, but canned pumpkin (actually, pumpkins in general!) are very expensive. Does anyone know why? They really aren’t difficult to grow and they are definitely in season now! If the bugs didn’t destroy my pumpkin plants this summer, I’d have my own to admire right now. 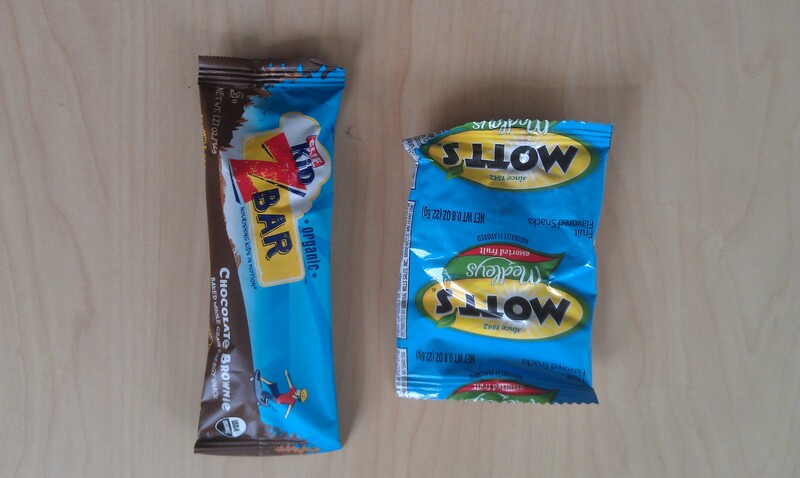 In between classes, I munched on another Clif Zbar. They are $0.50/bar. After 4 classes (2 of which I had exams in), I was starving! I grabbed the quickest thing I could think of: leftovers! Have you noticed my love of leftovers? Such a money saver and a great way to get good food in you! I could have easily stopped and grabbed a $6 cold cut from the shop, but I have a budget to watch! I ate leftover stuffing and cauliflower from dinner the other night. Leftovers are hard to put a price on, since they are the extra food from a dinner that you’ve already accounted for. I’ll say this lunch cost $1, but no more than that. Iced tea added another $0.20. 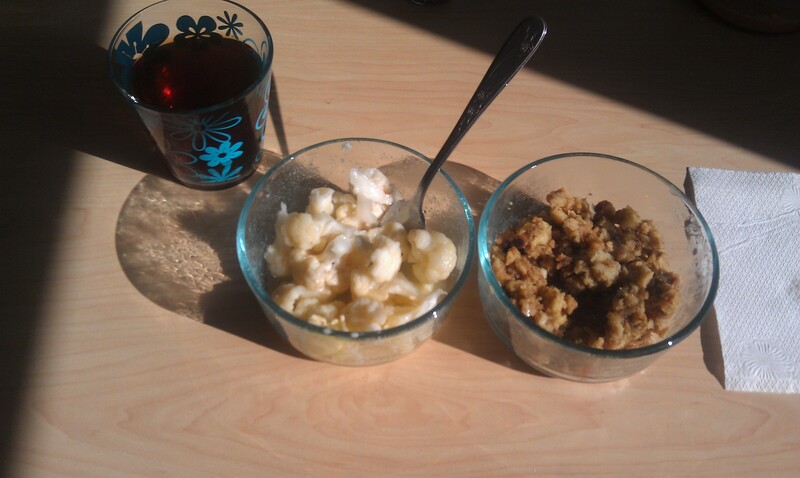 Lunch + snack + tea = $1.70. On Tuesdays and Thursdays, I have class from 9 am until 8 pm (with a small break in between) so making a complex dinner is really out of the question. I’m exhausted! Luckily, the boys took care of most of the dinner tonight. Don’t comment on the randomness (hot dogs and potatoes?! ), food is food! We had hot dogs (no roll, I don’t like them! ), roasted potatoes, and broccoli, cauliflower and carrots. They also had baked beans, but I don’t like them. I got the pack of hot dogs for FREE at Safeway (with this deal). The potatoes were approximately $1/lb. I ate about $0.50 worth. Veggies were $1 for the whole bag and I ate a fourth of it. 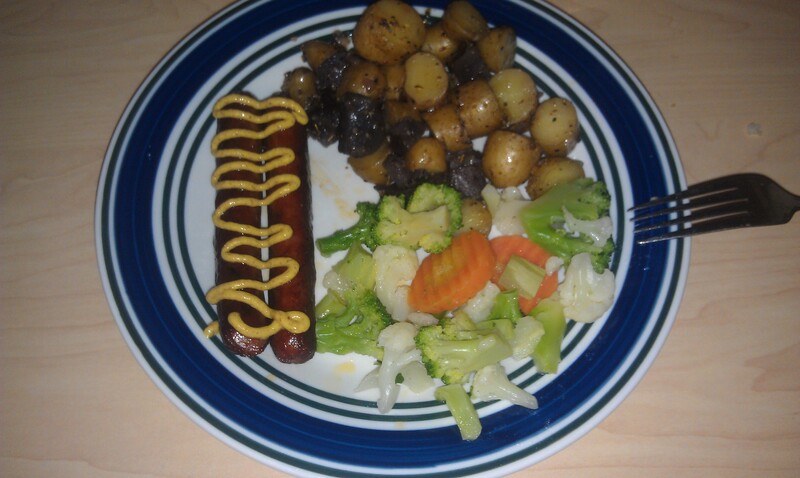 Dinner cost $0.50 for potatoes, $0.25 for veggies, and $0.20 for tea = $0.95. My total for today is $3.15! Week to date: $3 + $2.75 + $3.15 = $8.90. I have $21.10 and 4 days left. Today marks Day 2 of my Food Stamp Challenge! I am also double-posting this post on my class blog. I learned a few things from this challenge today. The first thing I realized was how much I usually snack! Now that I have to track everything single thing I eat, I think twice about snacking on crackers or sweets like I often do! I never really *need* those snacks, but they are surely missed! Maybe if people cut out their extra snacks, junk food, and soda, they’d be able to live on $4.30 with no problem. If you’re shopping right and doing the cooking, you should be able to eat 2-3 larger meals a day under budget. I find that the problem comes during snack time, because those snacks really add up! Luckily, couponing makes snacking easier. I can usually get things like fruit snacks and granola bars for cheap or free. When you’re on Food Stamps, you can still use coupons to save you even more money. Why wouldn’t someone use coupons?! I went to the farmer’s market today (because many of them accept food stamps!) and bought some apples to go with my caramel I bought at Safeway. I’m not sure why this vendor feels the need to charge $2.39/lb for their apples; that’s the highest I’ve EVER seen non-organic apples. Even the grocery store has apples regularly priced at $1.99/lb. 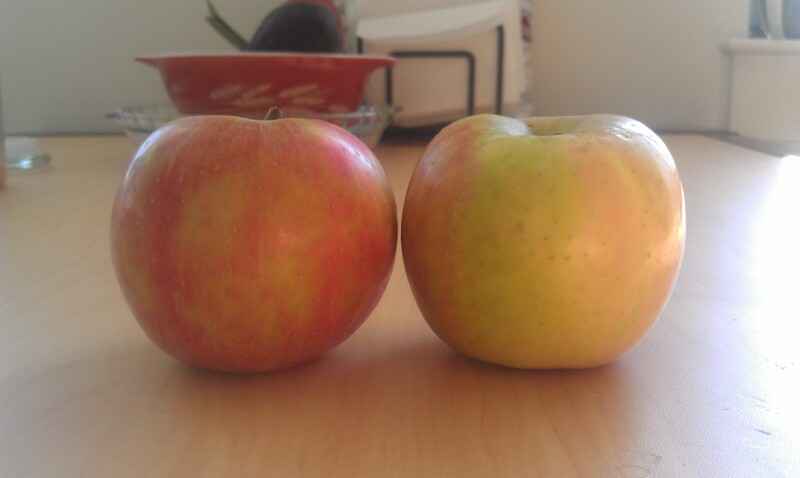 But in order to get the most out of this project, I bought 2 apples from the farmers market. Two apples cost me $2.33, crazy huh? At least they taste good! If you’re on Food Stamps and your local farmer’s market is as pricey as this one, unfortunately, I can’t recommend you shopping there. I have a garden, so I truly understand the time, work, and money that goes into growing your own food, but if you can’t have competitive (and fair) prices, then maybe you shouldn’t be selling it! I feel like they are really ripping people off. I usually get my apples from 2 other local orchards. Their prices are $1.49/lb and the other is $0.70/lb. $2.39/lb is a bit ridiculous, in my opinion. I skipped breakfast this morning and instead had an early lunch. I had another bowl of leftover homemade chicken noodle soup, which I estimated it cost me about $0.50, but probably less. One great thing about buying and cooking your own food are the leftovers -what a money saver! I also had some potato chips. A few weeks ago, I was able to pick up this bag of Lay’s for just $0.50 after my coupon. I’ll say that I ate $0.10 worth of chips today. I drank water for lunch out of my reusable bottle. Lunch cost = $0.60. I’m not sure how I made it all the way to dinner time without snacking, but I was starving and was so ready for dinner! We had tacos! The taco shells were FREE after my coupon a few weeks ago, so that cost was $0. 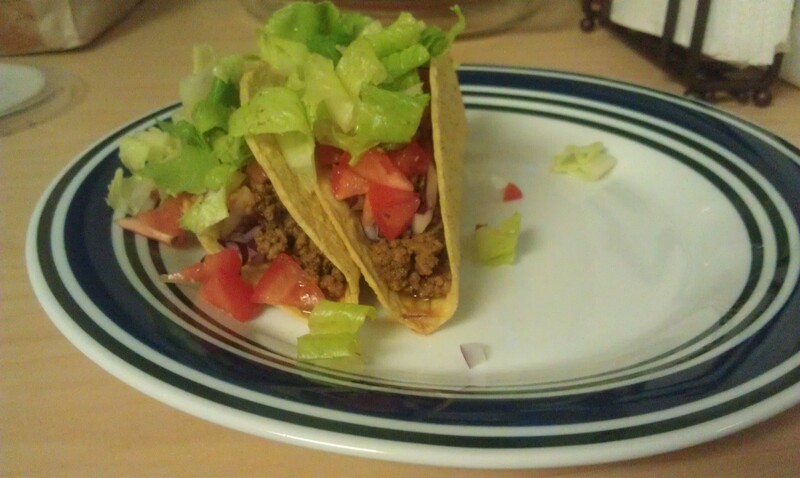 I ate 3 small tacos, using approximately 1/3 of a pound of ground beef. I bought the ground beef for $2.99/lb, so I ate approximately $1’s worth. The small amount of lettuce, taco spices, onion, and salsa I used probably another $0.75 to my total, but probably less, but I don’t want to underestimate. I also had 2 glasses of tea (at approximately $0.20/glass). My dinner total = $2.15. I’m full, ate some veggies, and avoided processed foods today (minus the potato chips! 😉 ). I probably ought to eat some fruit every day, but the prices at the farmer’s market are way out of my budget! My grand total of eaten food was $2.75. I’m not adding the price of the apples in because I haven’t eaten them yet. Week to date: $3 + $2.75 = $5.75. I have $24.25 left and 5 days left. I think I can do it! Today marks Day 1 of my Food Stamp Challenge! I am also double-posting this post on my class blog. I’m used to taking and pictures of every shopping trip I take and a lot of my food, so you’ll probably notice that in my posts! This week I will see if it’s possible to live on $30, the allowance given to a person on Food Stamps, or SNAPS. Before I begin, I must address that I am an avid couponer and an all-around frugal gal. I’ll be using my coupon skills and frugal ways to eat on $4.30 a day and keep it pretty healthy! I have nothing against Ramen, and you’ll probably see me eating it sometime this week, but I’d like to show how it is possible to get by on $30 a week by eating things a bit more nutritious than Ramen noodles! I went shopping over the weekend to pick up somethings for this assignment. Not everything I’ll be eating this week is pictured, obviously, but here’s just an idea. At Safeway, I spent $7.50 on 4 cans of soup, 1 can of caramel, 1 salt shaker (we were low and it was only $0.49! ), and some hand soap. The salt and hand soap aren’t included in my $30 allowance, as you can’t use food stamps to pay for them and condiments aren’t included. The soup, caramel, and carrots cost me just $4.96. I forgot to get apples for the caramel, so hopefully I have time to stop at the farmers market tomorrow and pick up some (at an atrociously high price). For breakfast I had a Clif Zbar (one of my favorite bars!). I bought the box of 5 on sale for $2.50, meaning each bar costs $0.50. In between classes, I ate a pack of fruit snacks. They were recently on sale at Safeway for $0.99/box. I got them for FREE after my coupon. 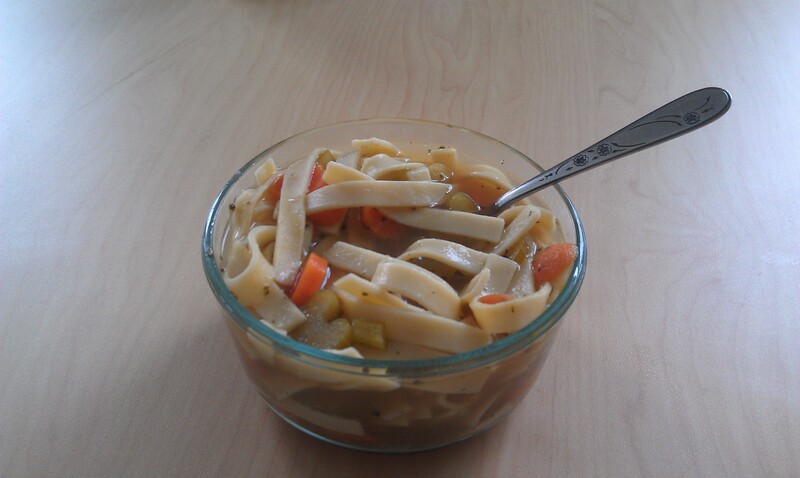 For lunch, I ate leftover homemade chicken noodle soup from the day before. The chicken broth was made from a chicken we ate over the weekend. The chicken cost $3.44, plus I was able to get 3 meals (and leftovers out of it). It’s hard to say exactly how much this one homemade bowl of soup really cost me, so I’m going to estimate and say $0.50, though I’m sure it was probably less. The Clif bar is organic, my Mott’s fruit snacks have no artificial coloring, and my soup was homemade. Sounds like some decent, health conscious foods if you ask me! 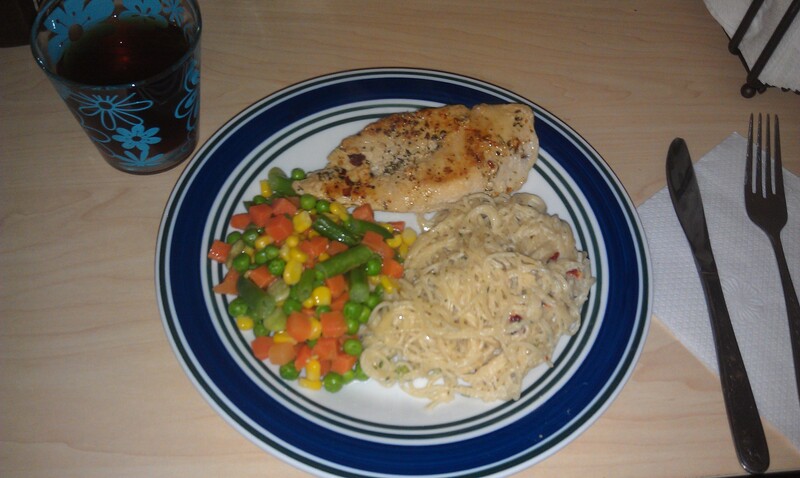 Lastly, dinner consisted of chicken, pasta and some veggies. The chicken breasts were $1.99/lb (I ate less than .5lb), frozen veggies were $1/bag (I didn’t eat the whole bag myself! ), and the pasta was on sale for $1/box. I also had some ice tea that I made myself. This meal was shared between 3 people. I’m estimating that dinner cost me $2. 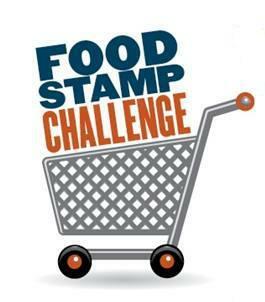 Next week, starting Tuesday October 9th, the Savvy Student Shopper is starting the Food Stamp Challenge! Have you heard of the Food Stamp Challenge? The SNAP Challenge gives participants a view of what life can be like for millions of low-income Americans. Most participants take the Challenge for one week, living on the average daily food stamp benefit (about $4 per person per day). Many people have taken the challenge, even members of U.S. Congress, to help educate the public and opinion leaders about what it means to live on a limited budget. As a part of the challenge, I’ll be blogging each day about what I eat and decisions I have to make, living on just $4.30. The challenge will last a week. I am doing this for a college class, so blogging is required on the class blog, but I figured I would double-post it on Savvy Student Shopper too.